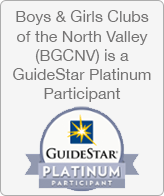 The Boys & Girls Clubs of the North Valley is celebrating YOU. We are delighted to share the impact our Clubs have been able to make this past year because of you. In every Club in our region, each and every day, we have achieved many mission moments of success – A youth with severe anger issues self-directs himself to our safe space for him. A child shares their first A on a test they received at school. A parent shares that their child is showing signs of improved respect and behavior. These magical moments are possible because of you! Thank you so much for believing in our youth and please enjoy our 2017 Annual Report that celebrates your investment in our kids. We are more grateful than ever to have friends like you by our side. In the coming year, we hope to help more children and their families by continuing to improve our existing programs, exploring new services, making new friends and appreciating the long-lasting ones. The problems kids face today can affect them for their entire lives. With your help, we are solving these day-to-day challenges at home, at school and in their daily lives to help them thrive.